The speaker for the March 11th meeting is John Jons. The meeting begins at 10am with refreshments, and visitors are welcome! Members are asked to bring any blooming roses or other plants to share with the group. Presentation Title: “Why do rose grow by the side of the road? … and why do they not grow in my garden!” Presentation by John Jons, Galveston Master Gardener and American Rose Society Consulting Rosarian. 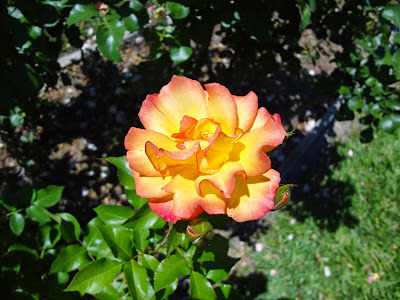 John will introduce you to rose culture and highlight that if you follow the basics of rose culture, anyone can grow large, beautiful smelling and healthy roses, in your own garden. For meeting details, click here. South Shore Harbor is a beautiful home to many businesses, including Furie Petroleum Company LLC. Furie is an independent company exploring for oil and gas in Alaska. The office at 100 Enterprise Ave. is owned by Schafer Realty, the property manager. The Furie office building is landscaped with an alley of Crape Myrtles, sculpted bottle brushes, encore roses, variegated gingers, and bananas around the entrance of the building; a private patio includes citrus trees, hibiscus, fox tail ferns and oleanders. With tropical plants in the landscape, evergreens make the landscape attractive year around and offer a refuge for wildlife. Bottlebrushes are attractive to many pollinators and it is good to see them being used in commercial landscapes. Wednesday, February 11th: Tim Jahnke, Galveston County Master Gardener, will highlight the benefits of gardening for physical and mental wellness. Click here for more information. Many of us may not be shopping for Jeeps, but Select Jeeps at 615 Hwy. 3 South is a dealer that specializes in the popular off road vehicle. The business is landscaped to display the off road capabilities of their product. With native Texas plantings and large boulders, the jeeps are right at home. Mass plantings of knock out roses create an inviting entrance to the property. A rustic gazebo and western art are featured throughout the property. Stop by and say hello to Matthew Gibson and Davin Morris at Select Jeeps, the League City Garden Club Business Landscape of January.